Partial-thickness rotator cuff tears are revealed in different clinical situations, can be asymptomatic or may cause pain and loss of function that affects the daily life. Compared with full-thickness tears, the incidence is reported to be higher and interestingly, they tend to be more painful than full-thickness tears. Conservative treatment should be tried firstly due to low progression rates. 3-6 months of conservative treatment should be applied before the surgical decision. Bursal-side partial rotator cuff tears are typically associated with impingement syndrome. CAL degeneration (Coracoacromial ligament degeneration) has been proposed as a well-known indicator for subacromial impingement. Surgeons should consider CAL release, debridement of the degenerative ligament tissue, or acromioplasty in patients with bursal-side partialthickness rotator cuff tear. Partial rotator cuff tears, Arthroscopic treatment, Bursal-side tears, Articular-side tears. Partial-thickness rotator cuff tears are a common source of shoulder pain and dysfunction. These tears are revealed in different clinical situations, can be asymptomatic or may cause pain and loss of function that Affects the daily life. The pain is especially at night and assosiated with in overhead activities [1-3]. Symptoms resulting from partial tears are thought be a consequence of nonphysiologic tension created within the remaining intact rotator cuff fibers [4,5]. Despite their high prevalence, the majority of studies on the treatment of rotator cuff tears have focused on full thickness tears. Compared with full-thickness tears, the incidence is reported to be higher and interestingly, they tend to be more painful than full-thickness tears. Lohr and Uhthoff examined the supraspinatus tendons of 306 cadaveric shoulders and found an incidence of 19% for full-thickness tears and 32% for partial-thickness tears . In a recent systematic review of 30 studies, 6112 shoulders was analysed with 1452 cuff abnormalities and rotator cuff pathologies ranged from 9.7% in patients younger than or 20 years and increased to 62% in patients aged 80 years and older (P<0.001) regardless of symptoms, among the general population and in patients with a dislocated shoulder. Age, menopausal woman, hand dominance, smoking, family history, posture, trauma and hypercholesterolemia are among the predisposing factors for partial-thickness tears . According to different structural characteristics, partial rotator cuff tears can be divided into 3 subgroups: bursal-side, articular-side, and intratendinous tears [1,2,8]. These tear patterns tend to be the end result of several pathophysiologic mechanisms that can be categorized as either intrinsic or extrinsic factors. Recent studies suggest that both intrinsic and extrinsic factors may be involved in the process of partial cuff tears [3,9]. This has led to a poor understanding of the natural history of the disease process and has compounded the debate over their optimal treatment. Age-related degeneration, anatomical impingement and trauma are accused of in etiology. These tears may be due to throwing sports, overhead activities, repetitive microtrauma or internal impingement in athletes [1-3]. This subject is particularly important because the estimated prevalence of partial-thickness rotator cuff tears is significant with apparent clinical symptoms, and it can be expected to increase because there is a correlation between increasing age and rotator cuff disease. According to the study of Sher et al. magnetic resonance imaging in 96 shoulders revealed a nearly 7-fold increase in partial rotator cuff tear prevalence in patients younger than 40 years compared with patients older than 60 years . Anatomic structure of the rotator cuff is consist of several layers. Clark and Harryman have identified five layers at rotator cuff . From bursal-side to articular-side: 1. Coracohumeral ligament (Figure 1), 2. Tendon, 3.Interlacing layer, 4. Transverse layer, 5. Capsule (Figure 2). Capsule has a length of 4-5 mm at the footprint of the greater tubercle in the medio-lateral direction (Figure 3) . Traditionally, first 50% part consists of the joint capsule and tears that larger than 50% of footprint is proposed to be repaired (50% rule) . Figure 1. Coracohumeral ligament (first and fourth layer) and tendon (second layer). Figure 2. Capsule (fifth layer of rotator cuff). Figure 3. Articular-side tear associated with capsule. These tear patterns tend to be the end result of several pathophysiologic mechanisms that can be categorized as either intrinsic or extrinsic factors. Recent studies suggest that both intrinsic and extrinsic factors may be involved in the process of partial cuff tears [3,9]. Metabolic and vascular causes of aging caused by degenerative tears . Intratendinous tears revealed the different shear stress . The main complaints of partial rotator cuff teras are pain and loss of function. Pain in the overhead activities and night pain are common but these findings are not specific to partial cuff tears. Compared with full-thickness tears, the incidence is reported to be higher, and interestingly, they tend to be more painful than full-thickness tears. The reason of this is more of the load bearing to the intact fibers . Fukuda reported that preoperative pain at the bursal-side partial teras is more than articular-side partialthickness and full-thickness tears . Maman et al, followed 30 patients with symptomatic partial cuff tears by MRI during 24 months [16,17]. In the follow-up results, the progress with tear size (>5 mm) were detected in the 10% of partial tears. Approximately 50% of patients with full-thickness tears were progressed. The findings in this study showed that symptomatic partial-thickness tears have lower rates in terms of progression when compared with symptomatic full-thickness tears and there is no difference with the localization of the partial rupture in terms of progression. Therefore, conservative treatment should be tried firstly due to low progression rates. 3-6 months of conservative treatment should be applied before the surgical decision [1,3]. The treatment comprised of active surveillance, a therapeutic modality, oral pain medication, steroid injection and shoulder exercises . The effectiveness of conservative treatment is not inferior to arthroscopic repair for patients >50 years old with a less than medium-sized rotator cuff tear in a 1-year follow-up period in terms of pain and range of motion . Corticosteroid, tenoxicam and PRP injections can be applied. The differences between the two methods can not be shown 6 months later [19,20]. The surgical treatment was applied for patients who do not benefit from conservative treatment. Surgical options include mini open or arthroscopic repair. We prefer arthroscopic repair technique to all rotator cuff tears. Patients can be operated under interscalene block or hypotensive general anesthesia in the lateral decubitus or beachchair position. Firstly, standard glenohumeral arthroscopy is performed to assess intra-articular rotator cuff disease, including partial rotator cuff tear and associated injuries. In patients diagnosed with articular-side partial-thickness tears, a tagging suture is placed at the tear site to evaluate the continuity of this tear from the bursal side. After glenohumeral arthroscopy, subacromial arthroscopy is performed to examine the bursal-side rotator cuff disease, coracoacromial ligament, acromion, and bursa. Although, to date, there is no consensus on a single algorithmic treatment approach and no high-level evidence to support a specific treatment algorithm for a patient with symptomatic partial-thickness rotator cuff tear. Articular-side tears are usually seen in the superior-posterior part of the tendon. Capsule tears can not pass 3-5 mm thickness, has a degenerative appearance and debridement is applied (Figure 3). Supraspinatus tendon tears are most common partial rotator cuff tears. Traditionally, tears that larger than 50% of footprint is proposed to be repaired (50% rule) [1,2,13]. Millstein and Snyder have called these lesions as PASTA lesions (Partial Articular Supraspinatus Tendon Avulsion) . In patients diagnosed with articular-side partial-thickness tears, a tagging suture is placed at the tear site to evaluate the continuity of this tear from the bursal side (Figure 4). There are two surgical technique for these lesions: trans-tendinous or tear completion repair. There was no significant difference between the two methods in randomized controlled trials [10,22]. In histology studies, degeneration rate was found in 90% in intact tendon after debridement . Therefore, tear completion repair technique has a higher priority. There is less study for bursal-side tears in the literature. Fukuda specified that the subacromial impingement is the most important reason for these tears . Tear completion repair technique is not preferable because tendon degeneration is less in intact healthy tissue. The functional results of the surgical repair of bursal-side tears are reported to be better than the articularside tears . Figure 4.Articular-side is intact and bursal-side tears are seen. Tear completion repair technique is applied. Data on the etiology of partial-thickness rotator cuff tears are relatively lacking in the literature compared with those available on full-thickness tears. Although CAL (Coracoacromial ligament) degeneration has been proposed as a well-known indicator for subacromial impingement [24-26]. In our clinic, 100 patients with symptomatic partial rotator cuff tear (50 bursal-side, 50 articular-side) were evaluated. This is a retrospective case-control study of intended for etiology of partial rotator cuff tears.The relationship between partial tears and degree of CAL dejeneration was investigated (Figure 5). There were 21 patients with grade 0 (21.8%), 40 patients grade with 1 (41.6%), 31 patients with grade 2 (32.2%), and 4 patients with grade 3 (4.1%) CAL degeneration. The average grade of degeneration was 1.72 in bursal-side tears and 0.85 in articular-side tears. Most patients with articular-side tears demonstrated grade 0 and grade 1 CAL degeneration (n=48), whereas patients with bursal-side tears had grade 1 and grade 2 (n=35). Compared with articular-side tears, there was also a significant positive correlation between the grade of CAL degeneration and bursal-side partial tears (P=0.001). In this study, the relationship between the advanced stage degeneration of coracoacromial ligament and bursalside partial rotator cuff tears has been shown statistically. However, the same relationship was not found with partial articular-side tears . As a result of this study, we recommend that shoulder surgeons consider CAL release, debridement of the degenerative ligament tissue or acromioplasty in patients with bursal-side partial-thickness rotator cuff tear because the significant correlation between bursal-side rupture and late-stage coracoacromial degeneration indicates that impingement syndrome is a prominent cause of bursal-side partial cuff tears. Figure 5.Arthroscopic images of grade 1 (A) and grade 3 (B) coracoacromial ligament degeneration. Orthopedic surgery nursing requires a separate interest and education, as other surgical branches. Unlike other branches, it needs to be careful and educated as it requires the use of various implants and hand tools. Surgery time is very important for shoulder arthroscopy. After a long time, the joint is swollen. Recognizing different hand instruments which used during arthroscopy, can shorten the duration of surgery. The responsibility of the nurse begins with the patient entering the operating room. These responsibilities are taking to the operation table safely, patient positioning and control of material and instrument’s sterilization, stability and operablity. Preferably at least two tables should be prepared. Sterile shirts, compresses and surgical instruments should be opened to this table. Surgical tables should be covered twice. Instruments which used during surgical suture technique are situated on the main table (Figure 6). Hand tools which used in surgcal approach and closure are situated on the instrument table (Figure 7). The preparation of the optical camera is one of the most important steps. Camera heads are placed on the camera sheath. It must be dry in terms of the comfort of the case. A stain or liquid on the camera affects the surgery negatively, duration of operation is extended. Camera is wrapped around the camera steath with adhesive tape, it is important not to take water (Figure 8). As a result, shoulder arthroscopy is a surgery that requires high concentration in terms of nursing. Guessing the next step by following the screen and preparing the instruments on the table facilitate the surgery for nursing. Figure 6.Preparation of the main table. 1. Hand tools of company set, 2. hand tools for knot, 3. Catchers, 4. Shaver tips, 5. Sutures, 6. Surgical set, 7. Gloves, 8. Shirt, 9. Hand tools for microcritical, 10. Gauze. Figure 7.Preparation of the main table. 1. Hand tools of company set, 2. hand tools for knot, 3. Catchers, 4. Shaver tips, 5. Sutures, 6. Surgical set, 7. Gloves, 8. Shirt, 9. Hand tools for microcritical, 10. Gauze. Figure 8.Preparation of the optical system. A. Cutting the end of camera sheath, B. Camera heads are placed on the camera sheath, C, D, E, and F. Wrapping around the camera with adhesive tape. McConville and Iannotti JP. Partial-thickness tears of the rotator cuff: Evaluation and management. J Am Acad Orthop Surg. 1999;7:32-43. Strauss EJ, et al. Multimedia article. The arthroscopic management of partial-thickness rotator cuff tears: A systematic review of the literature. Arthroscopy. 2011;27:568-580. Finnan RP and Crosby LA. Partial-thickness rotator cuff tears. J Shoulder Elbow Surg. 2010;19:609-616. Ellman H. Diagnosis and treatment of incomplete rotator cuff tears. Clin Orthop Relat Res. 1990;64-74. Gonzalez-Lomas G, et al. In situ transtendon repair outperforms tear completion and repair for partial articular-sided supraspinatus tendon tears. J Shoulder Elbow Surg. 2008;17:722-728. Lohr JF and Uhthoff HK. The pathogenesis of degenerative rotator cuff tears [abstract]. Orthop Trans. 1987;11:237. Sambandam SN, et al. Rotator cuff tears: An evidence based approach. World J Orthop. 2015;18:902-918. Yang S, et al. Biomechanical analysis of bursal-sided partial thickness rotator cuff tears. J Shoulder Elbow Surg. 2009;18:379-385. Mehta S,et al. Etiologic and pathogenetic factors for rotator cuff tendinopathy. Clin Sports Med. 2003;22:791-812. Kim SY, et al. Outcome comparison between in situ repair versus tear completion repair for partial thickness rotator cuff tears. Arthroscopy. 2015;31:2191-2198. Clark JM and Harryman DT. 2nd J bone tendons, ligaments, and capsule of the rotator cuff. Gross and microscopic anatomy. Joint Surg Am. 1992;74:713-725. Nimura A, et al. The superior capsule of the shoulder joint complements the insertion of the rotator cuff. J Shoulder Elbow Surg. 2012;21:867-872. Kanatli U, et al. Grade of coracoacromial ligament degeneration as a predictive factor for impingement syndrome and type of partial rotator cuff tear. J Shoulder Elbow Surg. 2016;16:134-138. Orhun H, et al. Results of limited open rotator cuff repair with partial acromioplasty for rotator cuff tears with subacromial impingement syndrome. Joint Diseases and Related Surgery. 2010;21:73-79. Maman E, et al. Outcome of nonoperative treatment of symptomatic rotator cuff tears monitored by magnetic resonance imaging. J Bone Joint Surg Am. 2009;91:1898-1906. Pedowitz RA, et al. Optimizing the management of rotator cuff problems. J Am Acad Orthop Surg. 2011;19:368-879. Lee WH, et al. Clinical outcomes of conservative treatment and arthroscopic repair of rotator cuff tears: A retrospective observational study. Ann Rehabil Med. 2016;40:252-262. Çift H, et al. Comparison of subacromial tenoxicam and steroid injections in the treatment of impingement syndrome. Eklem Hastalik Cerrahisi. 2015;26:16-20. Shams A, et al. Subacromial injection of autologous platelet-rich plasma versus corticosteroid for the treatment of symptomatic partial rotator cuff tears. Eur J Orthop Surg Traumatol. 2016;20. Millstein ES and Snyder SJ. Arthroscopic management of partial, full-thickness and complex rotator cuff tears: Indications, techniques and complications. Arthroscopy. 2003;19:189-199. Castagna A, et al. Deep partial rotator cuff tear: Transtendon repair or tear completion and repair? A randomized clinical trial. Knee Surgery, Sports Traumatology,Arthroscopy. 2015;23:460-463. Yamakado K. Histopathology of residual tendon in high-grade articular-sided partial-thickness rotator cuff tears (PASTA lesions). Arthroscopy. 2012;28:474-480. Kesmezacar H, et al. 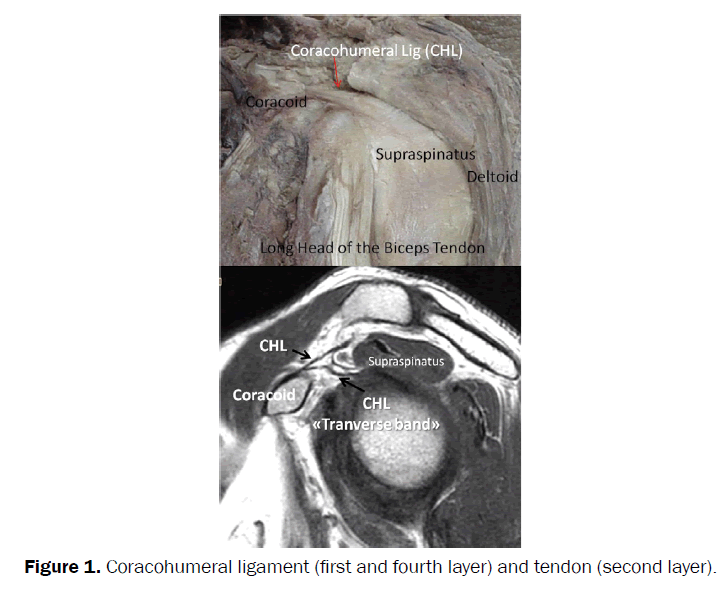 The coracoacromial ligament: the morphology and relation to rotator cuff pathology. J Shoulder Elbow Surg. 2008;17:182-188. Kim KC, et al. Repair integrity and functional outcome after arthroscopic conversion to a full-thickness rotator cuff tear: Articular-versus bursal-side partial tears. Am J Sports Med. 2014;42:451-456. Teunis T, et al. A systematic review and pooled analysis of the prevalence of rotator cuff disease with increasing age. J Shoulder Elbow Surg. 2014;23:1913-1921.